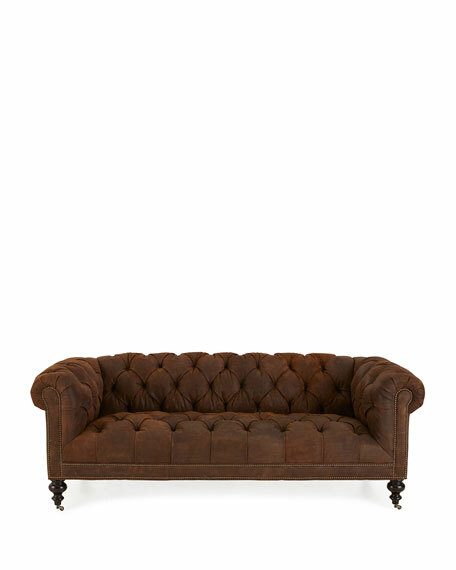 Old Hickory Tannery Morgan Rustic-Suede Chesterfield Sofa 86"
Old Hickory TanneryMorgan Rustic-Suede Chesterfield Sofa 86"
Leather has been reversed on sofa, showing suede side. Hand button tufted on all sides and seat. 86"W x 38"D x 31"T; seat, 62"W x 19"T.
Nailhead trim along front seat border and arm panels. Springs are hand tied to the frame and surrounding springs at eight points for lasting comfort and stability. Boxed weight, approximately 160 lbs.